My friend Juri Nummelin sent me one of those quizzes that go around the blogs. Memes, I think they're called? I've never done one of these before, so bear with me. 1.You're stuck inside FAHRENHEIT 451. What book do you want to be? THE SUN ALSO RISES. Hemingway sounds good read aloud. I dunno. Dejah Thoris, maybe, when I was about twelve. Modesty Blaise a few years later. Any crushes I had on fictional characters were probably directed more toward TV characters -- like Mrs. Emma Peel. DARK VOYAGE, a World War II espionage novel by Alan Furst. I've seen good comments about Furst's work in the past, but this is the first thing I've read by him. I like it quite a bit so far. Good characters, interesting plot, nice stripped-down prose. 4. What five books would you take to a deserted island? Assuming I'm going to be stuck there for a long time . . . a good Dashiell Hammett collection, a good Raymond Chandler collection, and the three Wandering Star/Del Rey collections of Robert E. Howard's Conan stories. 5. Who are you going to pass this along to and why? Is that a requirement? I think I'll just leave it here on the blog, and anybody who wants to take the questions and use them on their blog is welcome to do so. And if you want to answer them but don't have a blog, send the responses to me and I'll post 'em, or use the comments section. 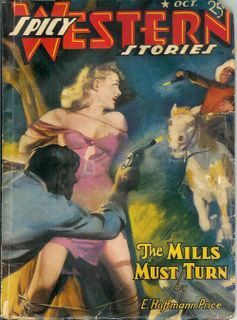 This large print edition is a reprint of a 1944 Phoenix Press hardcover, which in turn was cobbled together from a series of linked novelettes that appeared in the pulp WILD WEST WEEKLY in the early Thirties. This was a common practice in WILD WEST WEEKLY at the time, since the editorial policy called for no serials. 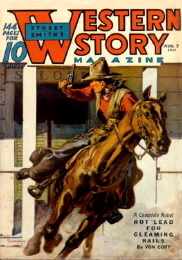 Tompkins, who is given credit for inventing what is called the “six-story series”, was the most prolific author of such series, which enabled the magazine to boast “All Stories Complete” on the cover (when actually they were anything but) and yet the authors could still put the stories together and sell them as novels later on. THE SCOUT OF TERROR TRAIL is one of the most famous six-story series from WILD WEST WEEKLY, not because it’s particularly good (it isn’t), but because it’s memorable for its bizarre, over-the-top setting and plot. The hero, Deo Daley, is a scout for the famous Eighteenth Cavalry, stationed at Fort Adios in New Mexico Territory. Daley’s nemesis is the notorious Mexican bandit leader, Don Chirlo (“the scar-faced one”). Unknown to Daley, but not to the reader, the real villain is cavalry lieutenant Curt Thode, who is working with Chirlo. Along with old codger Tex Garland and Tex’s beautiful and plucky daughter Irene, Daley discovers a Spanish castle in a hidden valley, built hundreds of years earlier by the famous pirate Don Picadero, who came to New Mexico after retiring from a career of looting ships on the Spanish Main and concealed a fabulous treasure somewhere in the Alcazar de los Ladrones – the Castle of Thieves. Whew. If you’ve followed all that, it should come as no surprise that Curt Thode and Don Chirlo also want to get their hands on Don Picadero’s treasure, so a hundred and fifty pages or so of running around the castle ensues, during which the two groups capture and are captured by each other, the heroes escape from numerous death traps and discover several secret passages – when they’re not being threatened with torture by the villains – and provide roughly the same amount of action you’d find in a movie serial from that era, and structured pretty much the same way, at that. Every so often the heroes appear to triumph, and that’s where the seams are between the original novelettes. This story comes from early in Walker Tompkins’ career. 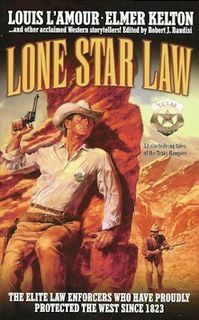 Later on he became a pretty solid author of more realistic traditional Westerns, and his books from the late Forties and Fifties are dependably quite good. At this stage in his career, though, he’s in full pulp melodrama mode (the villainous Curt Thode even has a pencil-thin mustache, immediately marking him as one of the bad guys). THE SCOUT OF TERROR TRAIL is so breathless and lurid that I enjoyed it, but I would recommend it only to readers who have an appreciation for pulp fiction’s flaws as well as its virtues. By 1957, when this novel was originally published, Walt Coburn’s once-formidable talent had deteriorated due to age and drink until his output was very hit-and-miss. THE NIGHT BRANDERS, from the same era, is the worst Coburn novel I’ve read. But he was still capable of turning out a good story sometimes, and luckily, THE SQUARE SHOOTER falls into that category. 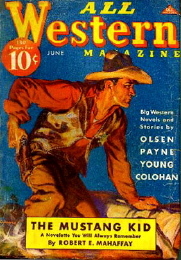 The plot is one that Coburn used many times: a young man is raised by an outlaw and believes the older man to be his father, only to discover that his past is really a mystery. In this case the young man is known only as Boone, and his outlaw foster father is Jawbone Smith. When he finds out that Jawbone isn’t really his father, Boone sets out to discover the truth about his past, making a deadly enemy out of Jawbone in the process. Boone’s quest involves him with a shady gambler, a judge and his beautiful daughter, a half-crazed mountain man, and assorted owlhoots, all of whom may or may not have secrets of their own that connect them to Boone. While this plot is nothing new, Coburn keeps a pretty tight rein on it this time, so that all the last-minute revelations at least sort of make sense. Coburn is obsessed with the sins and dark secrets of the past and their affect on the present, and sometimes his plots get away from him and become overly complicated. THE SQUARE SHOOTER avoids this for the most part and provides a fast-moving, exciting story. Worth reading. I've spent the past few days working around the house and struggling with the current book, so there hasn't been much to write about. My page production has hit a bit of a slump -- it was inevitable, I suppose -- but I know from experience I'll just have to write my way out of it. I've been watching a chapter from SOS COAST GUARD almost every night. Comments on it will appear when I've finished it. I'm reading a pretty good Western mystery called BLACK SOMBRERO, by William Colt MacDonald. My review of it will probably show up here eventually, after it runs in OWLHOOT. Speaking of which, in the next few days I'll be posting my reviews from the current mailing here and on the WesternPulps list. I had to go to Dallas this afternoon, so I was only able to work for a while this morning, but while editing yesterday's pages, I was relieved to find that they weren't all utter crap, after all. Sure, they needed some work -- I moved some stuff around and did some rewriting here and there -- but that's common. It's also pretty common for me not to like what I'm writing while I'm writing it, but when I go back to it in a day or two, it's not so bad after all. I suspect most writers go through the same thing. All in all, silly but very enjoyable. Now that I’ve watched Tarzan, Zorro, and this science-fiction serial, I’m leaning toward something more hardboiled for the next one, maybe S.O.S. COAST GUARD. A while back I agreed to let a young filmmaker, Patrick Wager, produce a short film based on my story "Graveyard Shift", which first appeared in MIKE SHAYNE MYSTERY MAGAZINE many years ago and has since been reprinted in several anthologies. Patrick informs me that the film is finished and has been entered in the Amazon.Com/Tribeca Film Festival. It can be seen on-line at www.amazon.com/screeningroom . I haven't watched it yet myself, but I'm looking forward to it. A while back I was talking about authors who were popular in their time but are almost forgotten now. F. Van Wyck Mason probably falls into that category. Not many people reading his books these days, I'd guess. And he was popular in two genres, not just one. I first became aware of Mason's work in the Sixties, when I was a huge fan of spy, secret agent, and espionage fiction. I read everything I could find along those lines, so it's not surprising I came across several paperbacks about Army Intelligence officer Colonel Hugh North, written by someone with the sort of odd name Van Wyck Mason. I liked the ones I read, books with titles like TROUBLE IN BURMA, MARACAIBO MISSION, DARDANELLES DERELICT, and HIMALYAN ASSIGNMENT. As you can tell, North was something of a globetrotter. I was working in the local public library at the time, and someone donated a bunch of old mysteries. That was when I discovered that Hugh North had been around for quite a while, starting as a captain in novels written in the Thirties such as THE WASHINGTON LEGATION MURDERS and THE BUDAPEST PARADE MURDERS. I liked these even better than North's later adventures. After a while, working in the library as I was, I became aware of a historical novelist named F. Van Wyck Mason. Had to be the same guy, surely. 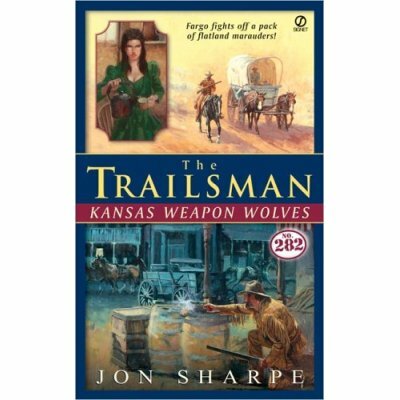 But I didn't read many historical novels then, so I never gave one of Mason's a try, despite my fondness for the Hugh North books. I had read all of the Captain/Major/Colonel North novels I could find by the end of the Sixties, and after that I didn't read anything else by Mason for a good thirty years. But when I started buying old issues of the pulp magazine ARGOSY on eBay a few years ago, I noticed lots of novelettes and serials by an author by-lined on the covers as F.V.W. Mason. It took me a while, but eventually I realized this was the same guy. I read several of his historical adventure novels that were serialized in ARGOSY and liked them quite a bit. Like the Hugh North novels, they were never flashy, just good solid storytelling with a fine sense of time and place. 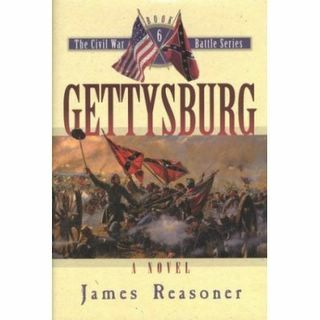 All this was on my mind because I'm currently reading a Civil War historical novel by Mason entitled PROUD NEW FLAGS (Lippincott, 1951) and enjoying it a lot. Yes, it's a little old-fashioned, but as you'd expect from someone who cut their writing teeth on the pulps, it has a good sense of pace and action. F. Van Wyck Mason may be forgotten, but he's still worth reading, at least to me. The April 2005 issue of THE CIMMERIAN (which is Volume 2, Number 2) is now available. My copy arrived today, and I've already read enough of it to know that I'm highly recommending it, as usual. Readers can also vote in the first annual Cimmerian Awards. This is the cover of the hardback, but the CD box looks almost identical. The fine folks at Cumberland House sent me a copy of my novel GETTYSBURG (#6 in the Civil War Battles series, for those of you keeping count) on CD. It's produced by Blackstone Audio, read by Lloyd James, and the very nicely packaged boxed set contains 9 CDs. I listened to some of the first one and thought it was extremely well-done. Sound quality was excellent, and the reader did a good job. I thought the words actually sounded better on the CD than they did in my head when I was writing them. Following in the footsteps of Bill Crider and Ed Gorman, I guess I'll muse a little about the books I liked as a kid. Nearly all of them were series books, and the first series I recall really liking (I was about seven at the time) were the Freddy the Pig books by Walter Brooks. The premise, as I remember it, was that animals could talk, it's just that nobody ever bothered to ask them anything, until finally a pig named Freddy spoke up. Then all sorts of adventures ensued. I checked out every one of these I could find from the bookmobile. I always liked mysteries as well, and soon discovered the Hardy Boys. I read all of those that were available. Only read one Nancy Drew book in my life, though. I guess back then I was still in my "girls are icky" phase. I've been told that the original Nancy Drew books hold up better than the Hardy Boys, though. My favorite along those lines was the Rick Brant series by John Blaine (who was actually a writer named Hal Goodwin, I found out years later). Rick Brant was a teenage boy who lived on an island with his scientist father and a bunch of other scientists, and he and his friend Scotty had adventures all over the world and hung out with famous scientists and spies. Absolutely wonderful stuff. I reread some of these a few years ago and still thoroughly enjoyed them. By fifth grade I had discovered Westerns and was a fan of Max Brand, Clarence E. Mulford, and Zane Grey. That's also about the same time I started reading science fiction, mostly Robert A. Heinlein (HAVE SPACESUIT -- WILL TRAVEL was the first one of his I read) and Isaac Asimov, as Paul French (the Lucky Starr books). I was also fond of Tom Corbett, Space Cadet. But nobody was cooler than John Carter of Mars. Over in the mystery section I had found the Three Investigators books but was also moving on to more adult material -- Ian Fleming and Mickey Spillane, to be precise. A year or so later I was reading Agatha Christie and ripping through every Leslie Charteris Saint book that I could get my hands on. Shortly after that, Doc Savage and then Conan, and on and on, and I'm still at it . . .
Then there were the comic books -- but that's enough wallowing in nostalgia for now. It occurred to me that since I put a photo of myself on this blog, I ought to give credit where credit is due. That photograph was taken by my wife Livia several years ago while we were visiting Corpus Christi. That's the U.S.S. Lexington behind me. I think I've talked about the Lex on here before. It's a great place to visit for anybody who's interested in World War II naval aviation. I've been all over the ship (at least every place they'll let the public visit) from the engine room to the pilots' ready room to the bridge. It's a really special feeling walking the flight deck. And this is coming from somebody who doesn't particularly like boats or the ocean and refuses to fly. No, I'm not talking about this blog, although I'm sure it qualifies a lot of the time. I'm talking about the book of that title by Steve Martin, a collection of short humor pieces published by Hyperion in 1998. I've always liked Steve Martin, ever since he was a writer and occasional performer on the Smothers Brothers TV show almost forty years ago. Most of his work seems to be smart without being smug, and he's never afraid to indulge in some sheer silliness when he needs to. I ran across a copy of PURE DRIVEL not long ago and have been been reading it in bits and pieces, finished it earlier today. Most of the essays first appeared in THE NEW YORKER, and while I don't think of myself as a New Yorker kind of guy (although I did once, when I was in college), I really enjoyed them, especially one called "Writing is Easy!" If I can get away with one short quote: "A Word to Avoid: 'Dagnabbit' will never get you anywhere with the Booker Prize people. Lose it." If that strikes you as funny as it does me, I highly recommend PURE DRIVEL. Since I'd written for fourteen days without a break, I thought it might be a good time to take a day off. However, the day started before dawn when the schnauzer got out of the yard and then began to pitch a fit because he couldn't figure out how to get back in. That woke me considerably earlier than I normally get up, and I had to go out, round up the dog, and fix the fence, all before the sun was up. Later, we ventured out to Wal-Mart and bought weed killer and Amdro. I was all ready to spray the weed killer on the front yard when I noticed the fine print saying not to use the stuff on St. Augustine grass. Since we have some St. Augustine, we decided we'd have to take it back and get something else that's safe to use on St. Augustine. I felt like I needed to get something accomplished, so I opened the Amdro and spent the rest of the afternoon on the traditional Doping of the Far Aint Mounds. I didn't realize how many of them we had this year. Took the entire giant economy-sized container of Amdro. Of course, it won't get rid of the ants, but it might annoy them a little. That's about the best you can hope for with the dreaded Far Aints. So after all that, the pages I have to write tomorrow don't look so bad. I’ve already started watching another serial, this one from 1936 – UNDERSEA KINGDOM. This is one of Republic’s science fiction serials, which means lots of bizarre costumes and goofy-looking robots. It seems that eccentric scientist Professor Norton has invented a machine that will predict earthquakes, and he plans to use it to locate the cause of a series of mysterious quakes that are causing great damage along the East Coast. Since the source of the quakes seems to be somewhere in the Atlantic Ocean, discovering their origin will necessitate the use of another of Professor Norton’s inventions, the Rocket Submarine. This sub is under the command of naval commander “Crash” Corrigan, who is played, appropriately enough, by Ray “Crash” Corrigan. The sub sets out into the Atlantic, and on board are Corrigan, Professor Norton, a plucky female newspaper reporter, a somewhat crazed assistant, and a couple of comic relief sidekicks played by Smiley Burnette (best known later on as a sidekick to Roy Rogers and Gene Autry) and Frankie Marvin. The professor’s young son is a stowaway, the typical kid sidekick whose main job is to get in trouble and need rescuing. Unknown to any of our heroes from the surface, at the bottom of the ocean lies the lost civilization of Atlantis, which sunk not in an overnight apocalypse, as many believe, but rather slowly enough so that the inhabitants were able to construct a giant dome over it, where their descendants now live. The people of Atlantis have split into two warring factions, one of which wants to also make war on the surface world. These are the villains responsible for the devastating earthquakes plaguing the United States. Things really get weird in the scenes set in Atlantis. Despite their super-science (the Atlanteans have flying warships that are dead ringers for the Enterprise in the original Star Trek), their soldiers gallop around on horseback. Of course, this is so that the stuntmen and riding extras I mentioned in my post on ZORRO’S FIGHTING LEGION can play Atlanteans, too. (I can just imagine the reaction of some of those old cowboys when they were told they had to wear Roman-looking tunics and silly helmets.) Some places in Atlantis have a tropical, jungle-like appearance about them, but mostly Atlantis is sagebrush and boulders and looks just like the location where all the Republic Westerns were filmed. I expected to see the Lone Ranger gallop out from behind a rock and give chase to the evil Atlanteans. Despite my sarcasm, I thoroughly enjoyed the first episode. There’s lot of miniature work by Howard and Theodore Lydecker, Republic’s special effects wizards. I’ve always been able to get in touch with my inner ten-year-old without much trouble, so I don’t mind the goofiness. Ray Corrigan is a likable hero (he played Tucson Smith in many of the Three Mesquiteer B-Westerns from Republic). I don’t expect UNDERSEA KINGDOM to be as good as ZORRO’S FIGHTING LEGION, but I do think it’ll be quite entertaining. I have to admit, I like Daylight Savings Time. When I was a kid, one of the great things about summer was that it stayed light so late, which meant there was more time for playing baseball or football in the area we called The Park, which was actually a sort of vacant lot formed by the road where I lived going around in a circle. And that was in the days before DST, so it was actually light only until about 8:00 or 8:30. Now with Daylight Savings Time, it doesn't get dark in the summer until after 9:00, and that's fine with me. I don't play ball anymore (which is something I regret sometimes), but I love to get out and walk, and evenings are a good time for it. Heck, even today I was out walking between 7:30 and 8:00. That does wonders for clearing the head after a day spent staring at the monitor and wondering how the hell I ever wrote myself into the corners I found myself in -- and how in the world was I going to get out of them. That's the trouble with writing. You have to think too blasted much. This serial came highly recommended by Bill Crider, but despite that, I had a few doubts as I started watching it. The cast is lacking most of the familiar Republic Pictures stalwarts (No Roy Barcroft? How can you have a gang of evil-doers without Roy Barcroft?) and the villain, at first glance, is more laughable than menacing. Don Del Oro, supposedly the reincarnation of a Yaqui god, wears a suit of golden armor and a golden mask so huge and top-heavy it's all he can do to shuffle around without falling flat on his face. Despite the fact that the story is set in Mexico in the 1820s, not long after Mexico gained its independence from Spain, the members of Don Del Oro's gang are played by the same stuntmen and riding extras who played outlaws and sheriff's posses and ranch hands in Republic's other Western serials, so they all sound like cowboys. Of course, it might have been even more ludicrous if they had tried to adopt phony Mexican accents. Charles King, who played the villain in many a B-Western, is one of the henchmen and looks out of place in his vaquero outfit. Go to the Black Horse Westerns site to enter a contest for a free, signed copy of the Chap O'Keefe novel THE REBEL AND THE HEIRESS. And there's plenty of other good stuff to read while you're there.